UPDATE NOV 2016: Royal Bank of Scotland agreed to set aside £400m to compensate up to 12,000 small business customers that it “allegedly mistreated” in the wake of the financial crisis. Leaked RBS documents confirm that their "Project Dash for Cash" incentivised staff to search for companies that could be restructured and have their assets sold off, or have their interest rates bumped up. The documents also show that where business customers had not defaulted on their loans, bank staff could find a way to "provoke a default". In 2014 RBS said the department responsible, the Global Restructuring Group, was not there to make a profit. Weeks later, as the scandal was exposed, the then RBS chairman Sir Philip Hampton was forced to admit that it was. The author of this guest post is a member of Bully-Banks, an alliance of small and medium businesses that were victims of the Interest Rate Swaps scandal that has ruined many UK businesses. (ii) a number of poor sales practices used in selling other interest rate hedging products. (iii) We also found that sales rewards and incentive schemes could have exacerbated the risk of poor sales practice." (iii) (iii) review the sale of caps if a complaint is made by a non-sophisticated customer during the review. The exercise for each bank will be scrutinised by an independent reviewer and overseen by the FSA." (iii) more than 50 employees. b) “independent reviewer” – The proposed use of major firms of accountants to act as ‘independent’ adjudicators is fundamentally flawed. Each of them has significant commercial relationships with the banks and have previously been used by the banks to close down or put into administration businesses damaged by the mis-selling of IRSAs. 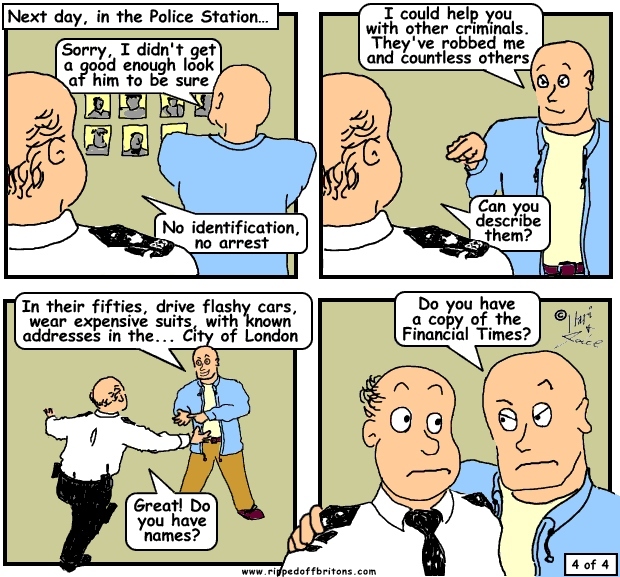 Do you know of any other situation where someone is robbed and then the system which is supposed to look after you appoints the criminals to resolve your dispute? We have serious misgivings about the decision by the Financial Services Authority (FSA) to appoint the guilty parties - the banks - as judge and jury by giving financial accountants and consultants who are very likely to have other business with them to decide whether a mis-sale of an IRSA has occurred. And the definition of “non-sophisticated” seems intended to let the banks off what are likely to be their larger mis-selling cases. A “sophisticated” company, as defined by the FSA, is likely to be in a bigger hole as it is likely to have entered into a bigger IRSA – but is just as unlikely to include a sophisticated finance specialist able to deal in swaps. 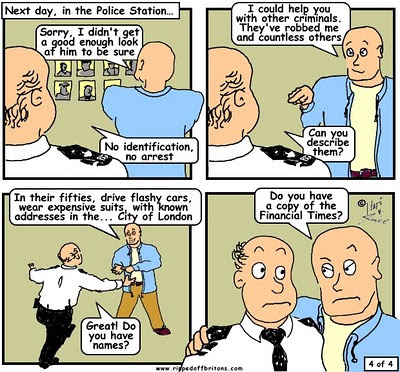 I know of a Bully-banks member who after a 25 year career as an ambulance driver had a business based around a property portfolio - and this meant, according to one recent judgment that he should have the knowledge of a 'property specialist'. I also know of a few printers who exceed this turnover but their sophistication is in their trade, their ability to make a business out of their craft, not in having an expertise in what are called 'non-vanilla financial products. · There are no clear criteria, definition, or guidelines as to what constitutes a ‘mis-sale‘. The FSA proposed resolution is not only bad news for small businesses like me, but will encourage litigation and will primarily benefit lawyers and claims firms. Yet, there is an alternative. A better way forward to ensure justice can be done. There has evidently been a compromise agreement between the FSA and the banks - of which we were not party to. Sadly, in the same way the banks hoodwinked thousands of decent hard-working small businesses in mis-selling toxic products, they have used the same tricks at this stage. One positive to come out of this saga has been the example of small people standing up for themselves. In our instance, we have created a campaign group Bully-Banks: a commercially and politically independent group of the little people realising that enough’s enough, and we are fighting back. We have put forward a 14 point plan which we believe provides a just, fair and reasonable way forward to ensure justice is done and urgently resolve the estimated 28,000 cases of mis-selling, while avoiding the unsavoury aspects of the recent PPI mis-selling debacle. Our survey revealed a damning story of high street banks misleading and mis-selling ‘toxic products’ to small businesses across the UK which has led to them facing crippling costs with exorbitant break charges. Our study also reveals how this mis-selling has made the downturn far worse for the wider economy and how it is actually a hidden brake on economic recovery. I think the average is about 5 jobs lost; multiply that by the 28,000 business affected – and that’s a staggering 140,000 plus jobs - and that’s probably a massive under-estimate. So you’re probably wondering how is it that so many small businesses were taken for mugs? Our story seems fairly typical – although we probably must have bought one of the smallest IRSAs in the country. I run a Media Centre business. The idea was to create a hub for creative industries in a former mining area. It’s a good little business and we have won awards for our regeneration work. Our bank had done a good job: we originally chose them as we trusted the local manager. Several years on, our local manager has since retired but the bank in up-dating its arrangements for us provides a new overdraft facility, some adjustments to the mortgage, oh, and by the way, we are concerned about rising interest rates and we think you need to be protected, so as a condition of keeping things going, you will need this Cap and Collar product. No indication that there could actually be a negative cost. Yes, the small print mentions there would be a break cost, but no indication of how much. Sure, we’re grown-up business people. We did ask about the size of the break cost and we got this very mumbled response; and looking back it was like stealing candy from a baby. We trusted them, and they abused that trust royally. It now emerges the banks knew interest rates were going to go down, but approached its customers to sell them a product to guard against rising interest rates. In fact these cap and collar products - it’s only now we discovered they were what are called IRSAs - are so complex and complicated they are designed for multi-million pound transactions. We, like the other businesses affected, have been held captive by our banks. When we wanted to change banks - we were fed up with our bank for other reasons - the big shock was discovered; for a business with an annual turnover of just £32,000 they wanted nearly £40,000 as a break cost. Boy have we struggled to keep our Media Centre alive. We have hung in there and just kept going with it. Me and my business partner have had to use our life savings to keep the Media Centre business afloat. We sometimes get people saying ‘well you took a gamble, and it’s only when you lost you are complaining’. My response is that there isn’t a single casino or betting shop on this planet that does not tell you that first you are making a bet, and secondly, the cost of your bet. Talking with every other member of Bully Banks – these are small businesses ranging from chip shops to restaurants to property businesses – and we all seem to say the same: we weren’t looking to make a gamble or place a bet. We just wanted the financial products to run our businesses. Our battle continues. It looks like the Big Bad Wolf might still get me and thousands of other small businesses (why do I get the image of Jack Nicholson in 'The Shining’ in my head?). Our fight continues. Even if you’re not a small business affected by a mis-sale, our plight is causing a serious brake on your economic recovery. And everyone has to fight injustice wherever it takes place. 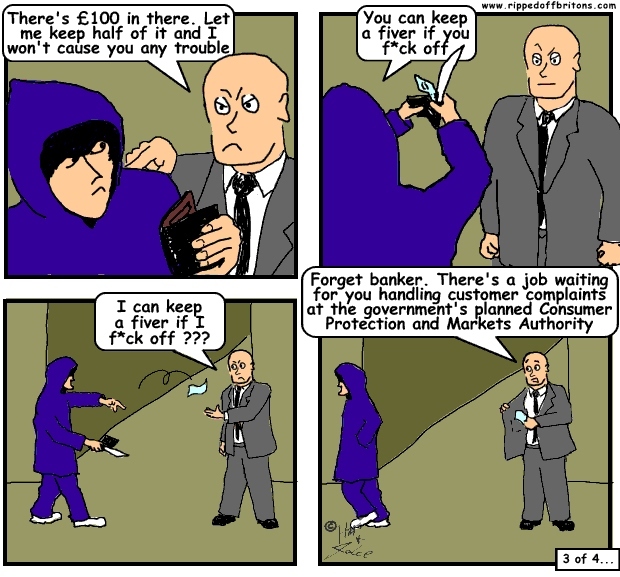 And are you going to let the banks get away with it yet again? The FSA used criteria which appear to have been copied from s.383(3) Companies Act 2006.
generous in the Directive than in the definition adopted by the FSA. Article 1 (31) of the Directive says: 'Measures to protect investors should be adapted to the particularities of each category of investors (retail, professional and counterparties)'. (a) Credit institutions, (b) Investment firms,(c) Other authorised or regulated financial institution,(d) Insurance companies, (e) Collective investment schemes and management companies of such schemes, (f) Pension funds and management companies of such schemes,(g) Commodity and commodity derivative dealers,(h) Locals, (i) Other institutional investors. Thus the Directive does not define any company or individual as a professional client if they do not meet the requirements of Annex II(2). It is submitted that such companies must therefore either be retail clients or counterparties who do not possess the relevant 'experience, knowledge and expertise to make [its] own investment decisions' for the purposes of the definition of professional clients found in Annex II (1) of the Directive; and who are entitled to a higher level of protection than professional clients. It is my contention that the FSA used erroneous criteria in coming to the agreement for redress with the banks, bearing no relation to the stronger protection afforded retail clients in the Directive. Besides offering wider redress to those businesses caught out by instruments other than structured collars, the FSA should amend the criteria to reflect the Directive rights of retail clients. 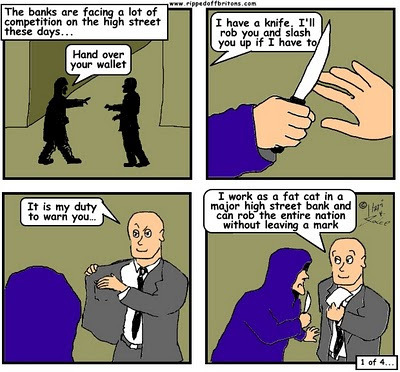 IBAS has been working for 20 years to attempt to level the playing field for UK bank customer and over that 20 years we could not believe that UK banking could get much worse or the reputation of UK banking fall any further. We had hoped that the FSA would live up to its own publications, particularly those on Principles and that those principles would mean proper policing of this industry. We also hoped that the Financial Ombudsman Service would eventually 'get behind' what banks actually do and how they work to protect themselves against legitimate customer complaints. However, many 'false dawns' have passed and banking excesses have not yet ‘peaked’. From that position we have to assume the FSA, the BBA and the FOS have become part of the problem - not the solution. LIBOR has been another 'own goal' for the banking industry and alongside the SWAPS complaints which the FSA (and the FOS) has been attempting to 'contain' or minimize with BBA ‘assistance’ have been a long time in surfacing but in our opinion these will be further 'own goals' for the UK banking industry. Hopefully, the most recent illustration of excess and conspiracy will now mean that the BBA is removed from any future LIBOR control/s and also that Government makes certain the political 'power' that the BBA has enjoyed for far too long ends. Perhaps, then we may all start to see UK businesses recovering? Banks in the United Kingdom have done a whole lot of misdealing that has impacted small and medium scale businesses to a large extent. Most of have heard about IRSA’s mis-selling that has impacted a lot of customers. Many customers have complained about the same and are looking for interest rate swap miss selling protection. Anyone who ever thought banks were there to serve anyone but themselves - is a fool. Believe me I've been there and it's not nice, but the bankers should tell you it's all part of the learning curve. 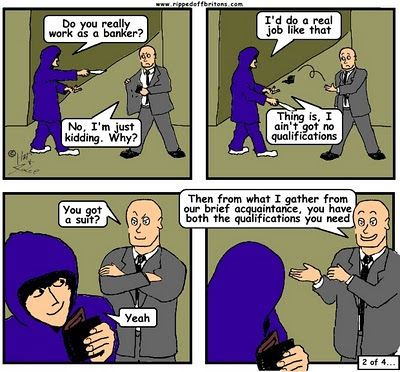 In the USA the bankers will tell you, that you don't know what business is about, until you've been thrice bust.